Cross Browser Testing is a type of testing to verify if an application works across different browsers as expected and degrades gracefully. It is the process of verifying your application’s compatibility with different browsers. Many times, I have encountered an issue with a website and on calling the technical support, they simply tell me to try it in another browser? When I do, it works and I end up feeling like a total idiot, even though I earn my living working in the software industry. I always end up thinking ‘why didn’t I think of that?’ But trust me, over time I have realized it’s not my fault; it’s just that the website has not been tested extensively with respect to cross-browser compatibility testing and as an end user I have just found a bug. 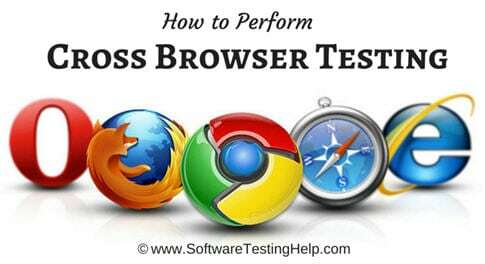 How to Perform Cross Browser Testing? We all might have observed that some websites are not properly displayed on some browsers and we just think that the website is broken. But, as soon as you open it on a different browser, the website opens up just fine. Thus this behavior explains the compatibility of a website with different browsers. Each browser interprets the information on the website page differently. Thus, some browsers may lack the features that your website is trying to show and make your website look broken on that browser. For Example, as shown below, the errors of the signup forms are not the same on both the browsers. Also, the text color, font etc., are also different if you take a look at them closely. With the advancement in technology, there are several options available for browsers, and it’s not just enough to make a website work on one of the browsers. Users should not be restricted to use any specific browser to access your application. Thus, it becomes necessary to test your website’s compatibility with different browsers. Some of the commonly used browsers include Chrome, Safari, Firefox, Internet Explorer etc. That being the background story, I bet you all have figured out the topic of today’s discussion – Cross Browser Testing. #1) Cross-browser testing is simply what its name means – that is, to test your website or application in multiple browsers- and making sure that it works consistently and as in intended without any dependencies, or compromise in Quality. But specifically, if we think: What is the intent of cross-browser testing? – This is twofold. The entire project team should have an invested interest, time, money and infrastructure to support this endeavor. In this case, a business identifies the browsers that the application must support. Testers then re-run the same test cases using different browsers and observe the application’s behavior and report bugs if any. In this type of testing, it is not possible to cover many browsers and also, the application might not be tested on major browser versions. Also, performing cross-browser check manually is costly and time-consuming too. Cross-browser testing is basically running the same set of test cases multiple times on different browsers. This type of repeated task is best suited for automation. Thus, it’s more cost and time effective to perform this testing by using tools. Experitest enables you to accelerate testing cycles and increase coverage by running parallel test execution on multiple browsers and mobile devices, including iOS, Android, Chrome, Safari, Firefox, IE & Edge. LambdaTest is cloud-based cross-browser testing platform utilizing which user can perform automated & manual compatibility testing of their website or web app on a combination of 2000+ different browser and operating system. Users can run Selenium automation tests on a scalable, secure, and reliable cloud-based Selenium grid and perform live interactive cross-browser testing of their public or locally hosted websites and web app on the cloud. Selenium is well known for automated testing of the web-based applications. Just by changing the browser to be used for running the test cases, selenium makes it very easy to run the same test cases multiple times using different browsers. This tool has a wide range of different browsers and their versions. This tool has a very simple interface and it’s only a matter of some settings to switch from one browser to another. It also offers cloud-based testing on real browsers. It offers recording videos, capturing screenshots and integration with slack and Jira. BrowserStack is a cloud-based web and mobile testing platform that enables testing applications across on-demand browsers, operating systems, and real mobile devices. It is a live interactive service that provides effortless testing for web developers and web designers. There are different browsers and operating systems and Browserling provides quick access to all the most popular browsers on the most popular operating systems. The time to start Cross-Browser test completely depends on your testing methodology and your testing timeline. Start this testing even when a single page is ready for testing. Test that page on each browser. When the next page is available, test that also on multiple browsers. This will increase the efforts, but it will help to fix the errors as early as possible in the life-cycle. Thus, fixing errors, in this case, is much cost effective. Start this testing when the application development is complete. This will test the application as a whole on different browsers. Fixing the errors won’t be as cost effective as in the above case but it will still help in fixing the errors before releasing the application to the users. This is the least favored time for performing a cross-browser test for your application. But it’s better to do it than to not do it and let the end users have a bad experience. After the application is released for the end users, this testing can be performed and bugs can be fixed as a part of the change requests in the application. This is very costly and requires multiple deployments depending on the bug fixes. Rigorous cross-browser testing can only be done when the testing team members who have knowledge of tools do this testing. High level or checking some specific browsers can also be done by business users or even developers. This testing involves testing the application thoroughly using different browsers. Testing thoroughly includes functional and non-functional testing of the application. In most of the companies, a product team has separate teams for functional and non-functional testing. Thus, this testing needs to be performed by the team(s) who is (are) responsible for functional and non-functional testing of the application. For this testing, a tester needs the browsers on which the application needs to be tested. Locally installed on tester’s machine. A virtual machine or different machines which a tester has access to. Tools which provide their own browsers and their versions for testing. On cloud – so that multiple testers can use the browsers as and when required. This testing is independent of the deployment environments. Thus, it can be done in dev, test, QA or even production environment depending upon the availability of the application in each of these environments. Base Functionality: Links, dialogs, menus etc. Graphical User Interface: Look and feel of the application. Response: How well the application responds to user actions. Performance: Loading of the pages within allowed the time frame. If your application works well on one browser, that doesn’t imply that it will work well on the other browsers too. Thus, this testing helps you to ensure that an application runs on different browsers without any errors. To identify what breaks on which browser and to fix the website accordingly we need to perform this testing. If a browser is not at all supported, then the users can easily be informed about it. The operation I was talking about at the beginning of this article that failed for me was an online bank transfer. I logged into my bank account, chose the amount for transfer as about one lakh and tried to perform the transfer and a servlet error was showing up no matter how many times I tried. So if the transfer operation is chosen for browser compatibility testing, this is how the test script is going to look like. If you have missed the bus on performing the cross-browser test during design, development and QA phases, it can still be done while the application is in production. However, this is the costliest of all and risky too. Usually, the answer to this question would be one of- Dev/QA/Production environments. But for cross-browser checking, this is not a definite and irrelevant (if I may say so). It can be done in any one or all of them. It is also a continues to process as software environments, browsers and devices are evolving every day and to make sure there are no unpleasant surprises, this browser Testing should be added to the repertoire of regression suites. As you know, each and every type of testing helps in improving the quality of the application and so does the cross-browser test too. Cross browser testing helps in creating a good impression on the users by providing them a consistent experience throughout the application irrespective of the browser or Operating system. Fixing bugs is cost-effective during the early stages of the development lifecycle, and the same applies to the defects found as a part of this testing too. This testing helps in improving your business which in turn results in Happy Customers, Happy You!! This is yet another testament to the concept that QA field or software testing is a multi-dimensional field and there is something for everyone to excel in. Please post your comments and questions below. We are always thrilled to hear from you! Nice tips on cross browser test. Also, each browser has their own browser engine and they have their own concept of displaying/rendering the Web content/pages, to test these we are performing testing on different browsers. So that making sure all the functionality and CSS are correct. Nice tips on cross browser testing. But I have one question that is, we are doing cross browser testing for checking the application functionality in different different browsers, so can we say that it is a functionality testing. Hi is cross browser testing a sub part of Usability testing? @all: Thank you for stopping by and your readership! firstly thanks for this article.actually i have asked one question is that cross browser testing and compability testing are same or not?? because the purpose of both are same i think. @Chetan: yes. Cross browser testing is also sometimes called Browser compatibility testing. But following statement needs further enhancement. Cross browser testing: testing your application on different version of same browser. Multi browser testing: Testing your application on multiple browser i.e Firefox, Chrome, IE etc..
Let me know what others have to say on it..
@colleen : Sure. Thank you for posting your question. We will surely publish an article on that. I have to do compatibility testing and i have 500 test cases then i have to test it on Browser,Operating system and Devices bot it should be done within 10 days what would be the approach for that. I would like to know whether we need to create separate test cases for cross browser testing or not ? Nice article.I want to know one thing that if we are testing one website on a browser ..do we have to test all the functionalities or some important ones on different browser ?? And also what is the relation of cross browser testing with load testing? how to make out in which browser to test when changes are made in the requirement? I just want to confirm, can we change the browser version as well? I am Manual QA-Tester in Networking Equipment manufacturing company.I want to learn HTML and Web Application testing and all the testing related with Web application and HTML,please give me some tips and guidance. can we check the applications in the cross browser testing? can i use the applications in the cross browser? Does Cross Browser Testing have any written Test cases ?? or just done Manual without Test case ? what are Defect i may get in Cross Browser testing ? Could you mention the possible scenarios to be perform while cross browser testing. Also provide negative scenarios for CBT. I have personally done cross browser testing a fair bit. I think what’s important is whether the content renders properly e.g. will the text be bounded or will it go right across the page? This applies to all the elements including modals. Basically, will it look ‘right’? As you probably know, different browsers and version would render the element differently. I find requirements or story support testing cross browser but mostly ad hoc testing is required or even exploratory testing. Something got to learn Thank you….